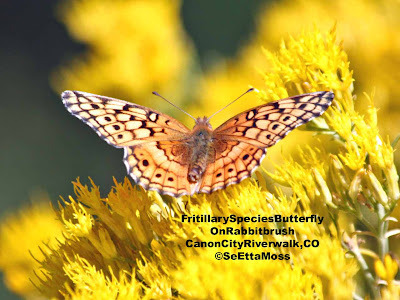 Painted Lady butterflies have been migrating through Colorado for the past week or so. I observed them moving through eastern Colorado last week when I birded at Lake Holcomb. 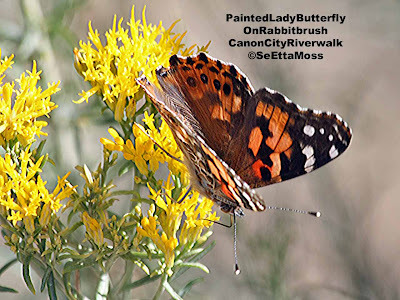 I saw more than 50 Painted Ladies, most flying south, in about 2 hours I was there. Panther Crossing Road--Photo:Robert Repenning/Transwild Alliance Fall can be a dangerous time to be on the roads. As daylight grows shorter, drivers need to be extra cautious -- not only for little ghouls and goblins on Halloween, but for deer, raccoons and other wildlife as well. Experts estimate that up to 1.5 million wildlife-vehicle collisions occur in the United States every year -- and October and November are top months for these types of accidents. Over 300 people are killed and 29,000 are injured in wildlife-vehicle collisions every year in the U.S., and 85% of deer-motorcycle collisions result in a human fatality. Roads are also a leading cause of decline for some species. In fact, 50 percent of all endangered Florida panther deaths are from vehicle collisions. and family to do the same. Yes, this pic only shows one roadrunner and the title says a pair. 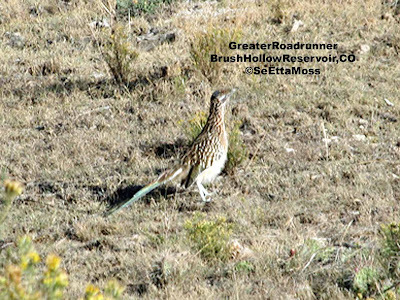 Indeed I did see a pair of Greater Roadrunners today at Brush Hollow Reservoir near Canon City, Co, but as is most often the case with birds they were not interested in posing for me. Indeed, this roadrunner was 80-100 feet away when I took this pic. The Canon City area and southeast Colorado in general is at the upper limit for Greater Roadrunner. Though I see this species around here, they are quite uncommon, and I have only rarely seen a pair together here. Brush Hollow Reservoir is a fairly scenic area as shown in the bottom pic. It is an irrigation storage reservoir and it is very low as much of the water has been drawn down due to a fairly dry summer here. According to Birds of North America online, "Well-established pairs stay on their territory year-round." As the two roadrunners I saw were traveling together, and both were adults, they would be an established pair.